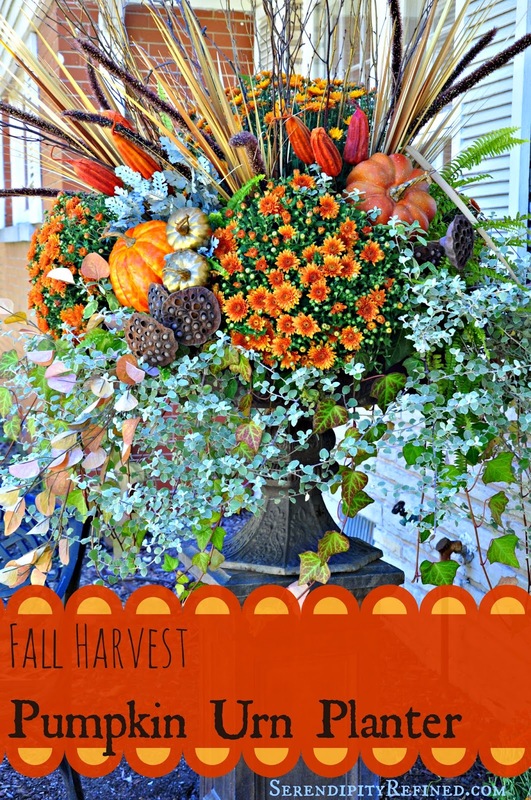 Since tomorrow is the first official day of autumn (and since the sun finally decided to pay a visit after about a week long vacation), I snapped a few quick photos of my fall harvest themed urn planter. I love combining orange and brown in the fall. This year, I added a little bling by spray painting a few small faux pumpkins and some birch twigs metallic gold. 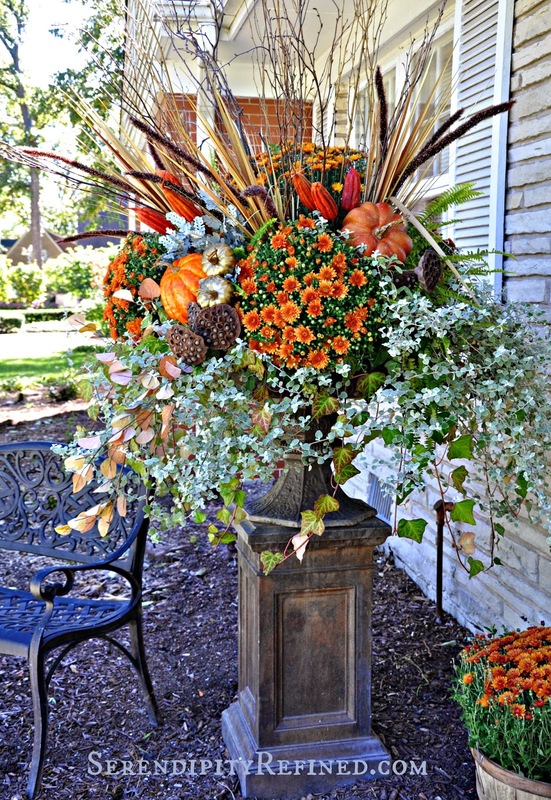 This urn arrangement was super easy to assemble. I left most of the plants from my summer urn planter, removing only the hydrangea (which were planted in my flower bed for next year), the geraniums and the white diamond frost plants. The live plants that remained in the planter were ivy, eucalyptus, sage and a few ferns. 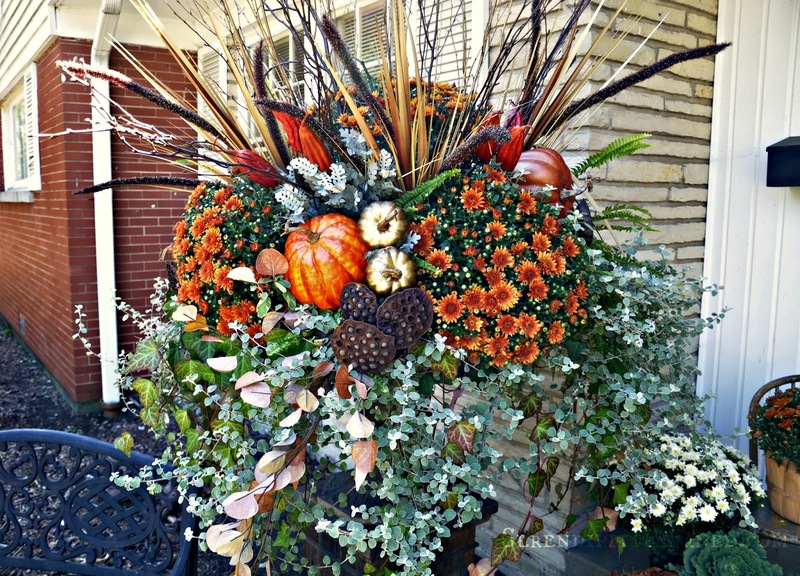 I added five orange mums, faux pumpkins and millet plants, dried lotus and jinga pods (saved from last year), sticks in both brown and gold (also saved from last year), and a couple of sprays of faux fall leaves (saved from so long ago that it may have actually been before some of you were born). 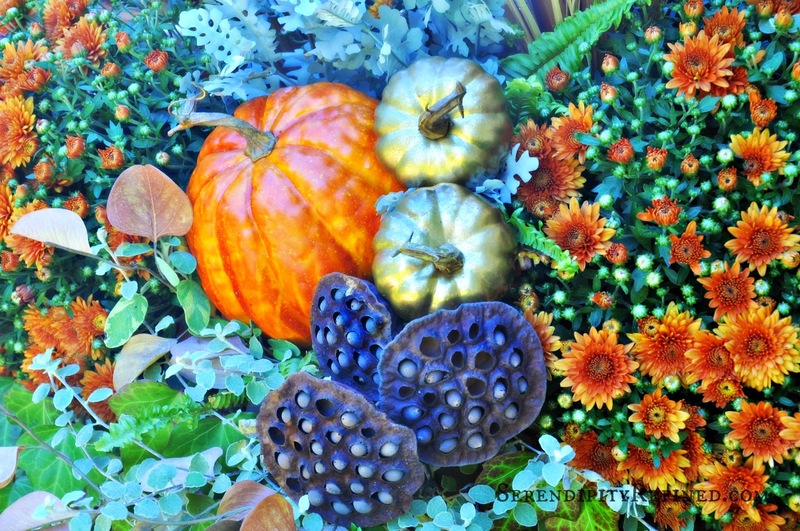 I'm still creating a fall vignette on the front porch which I hope to share soon if the weather continues to be as glorious as it has been for the past couple of days. Of course, now that I'm ready for fall, the temperatures have warmed to the point that I may actually need to water this planter to keep it alive! Maybe this is our "Indian Summer"...If it is, this weather can stay for as long as it would like to...you won't find me complaining! As much as I love fall harvest time and the glorious displays of brown, orange, and gold in the trees and in my urn planter, I'm also hanging on to the final few warm days before putting away my shorts and pulling out my boots and scarves. How about you? 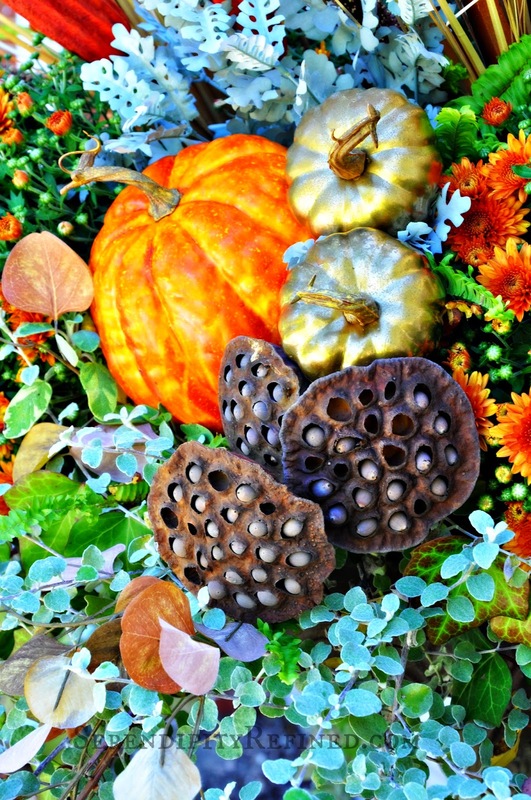 Has fall arrived in your area?